This uncommon surname is of Anglo-Saxon origin, and is a variant form of the locational name Hackleton, from the place so called near the town of Northampton in Northamptonshire. The place is recorded in the Domesday Book of 1086 as Hachelintone"; in the Assize Court rolls of the county of 1202 as "Hakelinton"; and in the 1220 Fees Court Records as "Hakelington". The latter form shows clearly the derivation of the variant surname Haglin(g)ton. The placename means "the settlement of Haeccel's people", derived from the Olde English pre 7th Century personal name "Haeceel", a diminutive of "Hacca", in turn derived from "haca", hook, used originally as a byname for a person with a conspicuously hooked nose, with the suffix "-ing(as)", people, tribe of, and "tun", enclosure, settlement. 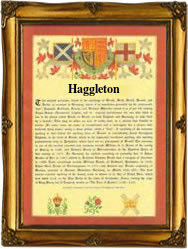 Locational surnames were taken especially as a means of identification by those who left their birthplace to settle elsewhere; regional and dialectal differences subsequently gave rise to variant forms of the original name, now found as Hackleton, Haccleton, Haggleton, Haglinton and Haglington. Sarah, daughter of John Haglington, was christened at St. Chad's, Shrewsbury, in Shropshire, on November 1st 1761, and Benjamin Haglington married Hannah Brownhill on December 21st 1835, at Tipton in Staffordshire. The first recorded spelling of the family name is shown to be that of Thomas Hacleton, which was dated April 28th 1566, a witness at the christening of his daughter, Anne, at North Kilworth, Leicestershire, during the reign of Queen Elizabeth 1, known as "Good Queen Bess", 1558 - 1603. Surnames became necessary when governments introduced personal taxation. In England this was known as Poll Tax. Throughout the centuries, surnames in every country have continued to "develop" often leading to astonishing variants of the original spelling.